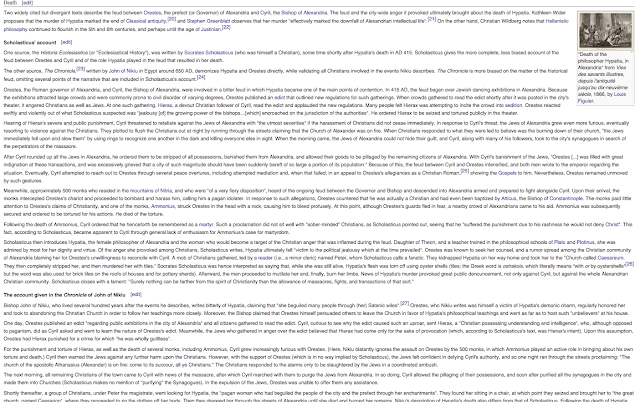 Today we consider the glorious wikipedia page Hypatia. Hypatia is quite a nice name, but surprisingly, according to the disambiguation, there has only been one other famous person called Hypatia in history - a pornographic actor - and even then it was a stage name. The name is derived from the Greek for "highest" or "supreme", which to me makes it sound even more awesome, but perhaps parents have avoided it for reasons of hubris. Hypatia was a badass philosopher chick from Alexandria in the 5th century AD. By "philosopher", I of course mean "general academic", best known for her mathematics. In Roman times everyone was a renaissance man, although I suppose it would be more accurate to call them simply naissance. What's incredible about the wikipedia page for Hypatia is its sense of proportion. Her life and work are of apparently trivial consequence compared to the authors' all-consuming obsession with one particular event: her death. Actually this is only part of it. Yeah, it's so long that even at maximum zoom-out, I still couldn't screenshot the whole thing. It's even got an illustration. As a lifelong fan of morbidity, you can see why this page appealed. Sod the fact that Hypatia managed to become a female director of a major academic institution of the hypermasculine classical world (the Platonist school of Alexandria), as well as the leading lecturer, thinker and possibly political advisor in the city. As one of the first women in history to be recognised for her academic greatness, we should be completely in awe of her gumption and strength of character, not just her scholarly prowess. Unfortunately, this seems to have passed most historians - and writers of crowdsourced encyclopaedias - by. While we have several detailed sources documenting her demise, it feels like nobody has wanted to talk about her actual life: a patriarchal conspiracy of epic proportions. If she'd been a dude, we'd know what she liked to eat for breakfast, but as a woman we don't even have a clue when she was born. Wikipedia gives a 20-year window for her DOB. 20 years! Not a single one of Hypatia's writings, which by all accounts were extensive, has survived. To be fair, she did have the bad luck to live in a city famous for routinely having its libraries destroyed, but even so, one can't help but feel that archivists, and history in general, have had it out for her. "On account of the self-possession and ease of manner which she had acquired in consequence of the cultivation of her mind, she not infrequently appeared in public in the presence of the magistrates. Neither did she feel abashed in going to an assembly of men. For all men on account of her extraordinary dignity and virtue admired her the more." So the one person who actually knew Hypatia makes her out to be a feminist trailblazer on a magnificent scale. Still, even this dude, who went by the incredibly humble name of Socrates Scholasticus, only deigns to give Hypatia a paragraph, and if there was anyone else writing about her, wikipedia doesn't bother to mention them. Contrast this to the attention lavished on her death. Suddenly wikipedia turns into a paragon of historiographical inquiry, comparing and contrasting the multiple sources that tell us about how Hypatia met her grisly end - with no clothes on! I won't dignify this episode with a major summary, suffice to say she was murdered by Christian fanatics who had been riled by the city's political/religious machinations du jour, and happened to seize on her as a scapegoat. Depending on the account, she was either stripped naked, torn to pieces, and set on fire, or she was stripped naked, dragged through the streets until she died, and set on fire. The important thing is that she was naked when it happened. And then she was brutalised and burned. This last detail has led some historians to describe her as effectively the first witch, which is kind of cool. The thinking goes: she was pagan, she worked with ancient knowledge that confused and scared contemporary laypeople, and she was burned by an enraged/illiterate Christian mob. She probably weighed the same as a duck too. After "Death", the next longest section of Hypatia's wikipedia page concerns her legacy. History has fought over this woman for centuries, despite the complete lack of information about her. Some have wanted to show her as a noble and virtuous practitioner of science and reason, while others have tried to portray a scheming pagan who literally possessed, in the cliche of a 7th century biographer, "Satanic wiles". Unsurprisingly, the issue of her virginity has vexed many commentators. In any event, she has cropped up in literature and research much more regularly than might have been expected for someone about whose actual life and work history has cared so little. All the poor woman probably wanted was to get on with her research and lecturing. Those lesson plans don't write themselves.